Malpas is a large village that used to be a market town. 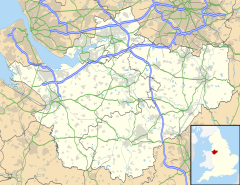 It is also a civil parish in the unitary authority of Cheshire West and Chester and the ceremonial county of Cheshire, England. The parish lies on the border with Shropshire and Wales. The name is from Old French and means "bad/poor" (mal) and "passage/way" (pas). There is no evidence for Roman settlement in Malpas, but it is known that the Roman Road from Bovium (Tilston) and Mediolanum (Whitchurch) passes through the village. Dedications to St Oswald are thought to be associated with Æthelræd II (879–911), also known as Earl Aethelred of Mercia and Æthelflæd of Mercia (911–918); they are known to have encouraged the growth of this cult along the Welsh border in places such as Hereford and Shrewsbury. This may indicate that Malpas was not a Norman 'New Town', but an Anglo-Saxon burh. A concentrated line of castles protected Cheshire's western border from the Welsh; these included motte-and-bailey castles at Shotwick, Dodleston, Aldford, Pulford, Shocklach, Oldcastle and Malpas. The earthworks of Malpas Castle are still to be found to the north of St. Oswald's Church. Malpas became more important when the western hundreds of Cheshire were detached to become part of Wales. By the late 13th century, Malpas became the most important settlement in the southern part of Broxton hundred. Develops significantly around the motte and church and becomes a market town – Malpas was granted a Market Charter for a weekly market and annual fair in 1281. The present church was built in the second half of the 14th century on the site of an earlier one, of which nothing remains. However, there is a list of earlier rectors. Extensive alterations were made in the late 15th century. The roof was removed, the side walls reduced in height and rebuilt with the current windows while the nave arcade was raised to its current height. An electoral ward in the same name exists. This ward stretches north to Edge and south to Wigland. The total population of this ward taken at the 2011 Census was 3,975. Roman Catholic Church, St Joseph's Church. United Reformed Church, High Street Church. ^ "Malpas Parish Council". Malpas Online. Retrieved 13 April 2018. ^ "2001 UK Census Headcount for Malpas". ^ "2001 UK Census People Statistics". ^ "Ward population 2011". Retrieved 29 May 2015. Churton, Ralph (1793) "A memoir of Thomas Townson, D.D., archdeacon of Richmond, and rector of Malpas, Cheshire", prefixed to A Discourse on the Evangelical History from the Interment to the Ascension published after Dr. Townson's death by Dr. John Loveday, Oxford, 1793. Wikimedia Commons has media related to Malpas, Cheshire. Malpas Community Website which includes sections on history, art, events, sports and social groups and businesses.